Woolworths continued to enjoy a rich cultural life in the 21st Century, with staff showing great pride in the brand and giving their time generously to charity events and good causes. The firm had a particularly vibrant Corporate Affairs/Public Relations Team after the Kingfisher separation. They identified many in-house stories to share with the media, and obtained help from celebrities to make them extra special, proving very skilled at placing such news in the national press, on TV and in niche magazines. Woolworths enjoyed a rich cultural and social life during the 'noughties'. Within eighteen months of the launch of its registered charity, Kids First, the stores and central teams had launched more than 2,000 projects and had raised over £600,000. The organisation had taken Kids First to its heart, and it had begun to deliver its founder's vision by establishing strong links into local communities, and by and helping to change children's lives for good across the UK. If you have fast, unlimited broadband, we've pulled together a film showing some of their work. The charity was one of very few initiatives launched under Kingfisher in the late 1990s that survived the separation. The CEO nurtured and developed it because it aligned well with the 'Kids and Celebrations' strategy and wider company values pursued after the demerger. It channelled the inate generosity and commitment of both staff and customers into community projects. During the 'noughties' colleagues went on to raise over £7m, as well as giving time and practical help in lots of ways, including painting schools and day centres, arranging outings and joining in with clubs and groups. The team at the administration, distribution and computing centre in Castleton near Rochdale consistently blaized the trail for Kids First, running a series of fund-raising events, some large and some small. They embodied the company's 'classless' value, and supported countless causes across the North West of England. 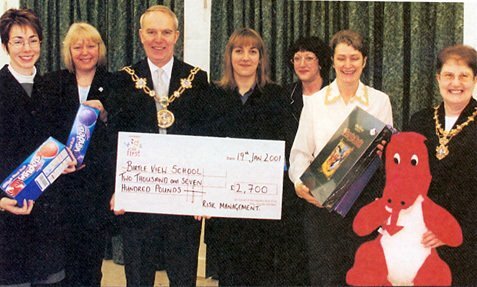 The picture shows members of the Risk Management team, who were responsible for keeping the stores safe and minimising losses of stock and cash, handing over a cheque for the £2,700 they had raised to Belle View School. 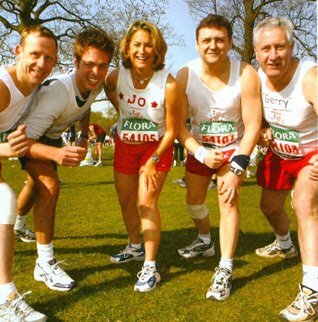 The core classless value was back in action when CEO Trevor Bish-Jones joined four colleagues in completing the 2003 London Marathon. The firm fielded runners each year during the noughties. Pictured (left to right) are Andrew Mann 4:31:19, Ed(ward) Preston 4:10:48, Joanna Mills 5:41:43, Trevor Bish-Jones 4:54:38 and Gerry McEvoy 5:00:26. 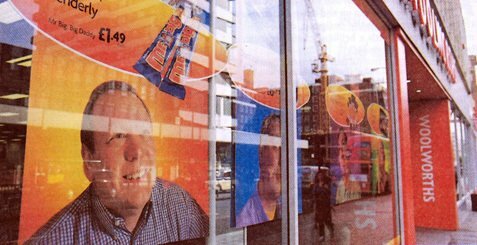 Six head office managers appeared on 'Fathers' Day wishes' banners in the windows of the 800 stores in 2000. The larger-than-life images showed the colleagues 'in the flesh' and made up as their favourite celebrities. John Farrow's Elvis Presley (shown in the window of the Edgware Road, London flagship) got particularly high approval ratings from the public and won many plaudits from his workmates at nearby Marylebone Road. Above (left to right) Mark Wood, Richard Gange, Gary Firth (Bezier Creative Print), Barrie Lucas, Karl Oldham and John Farrow. The Wholesale and Publishing Division arranged celebrity events. 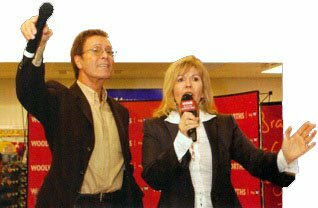 Sir Cliff Richard sold 200 books in Reading, Berkshire in 2002. Little Britain stars David Walliams and Matt Lucas wowed Wolverhampton. Celebrity show-stoppers included a personal appearance of Victoria Beckham with her friend, record and video producer Dane Bowers, and 'some footballer' who proved immensely popular with the public. The Lancashire Constabulary were on hand to regulate a huge queue of customers waiting to meet them. 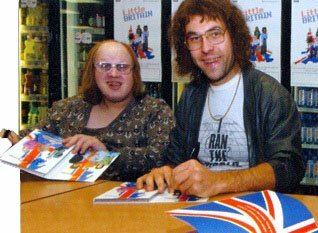 Wolverhampton's Mander Centre was overwhelmed by Little Britain fans when its stars made a personal appearance. 300 specially-made mugs were given away as they charmed all-comers. The store sold every copy of the Series One DVD and Book they could get hold of, and had one of its highest ever days' sales. Staff also remember a book promotion visit by Shane Ritchie with great fondness. Despite intense time pressure he took time to talk to each customer and made many friends that day. 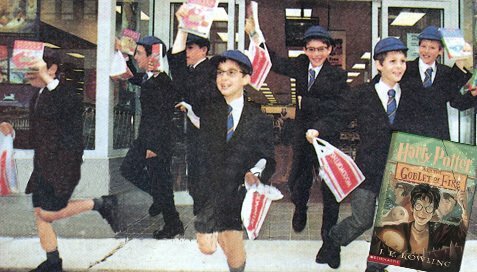 There was positive proof positive that even wizards needed pic'n'mix as seven 'Harry Potters' were snapped leaving the Edgware Road flagship store with Woolworths bags in hand! The publicity stunt, which attracted national media interest, helped the High Street stores to achieve record sales of J. K. Rowling's Harry Potter and the Goblet of Fire. 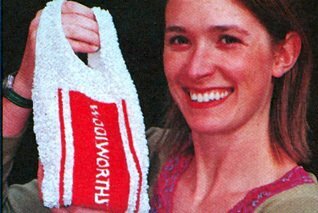 One item that was never offered in-store was trendy handbag designer Anya Hindmarsh's sequin-encrusted Woolworths bag. At £370 the company-appproved design was offered for sale in Hindmarsh's seven exclusive designer stores across the world, including showrooms in New York and Paris. One initiative that captured the imagination of younger customers, was the launch of Trading Card days shortly before the demerger from Kingfisher. These became established as a regular feature. They were scheduled to coincide with the half-term holidays. 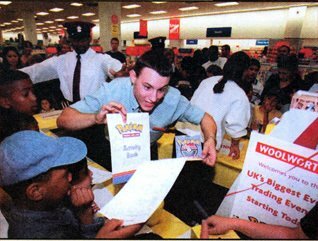 The larger stores soon found that swapping cards was a serious business for the kids, keeping security guards on hand to cope with the crowds. Woolworths' expertise at selling character-brands led to a number of deals. 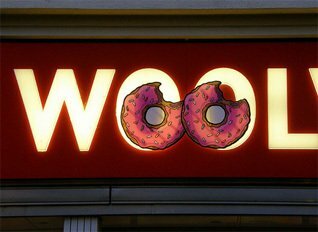 The legendary cartoonist Matt Groening generously drew Wooly and Worth on the famous Simpsons sofa, while Homer's donuts made a surprise appearance on the fascias of fifty UK stores to promote Simpsons The Movie at Christmas 2007. Groening also included a reference to the store chain in Futurama. Fry's feeble disguise on the robot planet was put down to the lack of Woolworths stores in that part of the galaxy! Ace film-maker George Lucas liked a company Star Wars video (made by our very own 3D and 6D Pictures) so much that he screened it to a brand marketing conference at the Hollywood Bowl, and gave a light sabre from the original Star Wars Movie to the Kids First charity. It was auctioned on eBay, fetching a jaw-dropping £17,000, which was enough to help Kids First to fund several Playground Partnerships projects. Whatever their other shotcomings between 2002 and 2008, the Woolworths Board's corporate social responsibility was exemplary and was widely acknowledged across the retail industry and among the suppliers. They inspired many of their 30,000 people to think about others who were less well off than themselves. The dedication and commitment of store colleagues that kept putting something back will be hard for others to match.